It may still be hot, but summer is well and truly on the way out, which means autumn is just around the corner. This season is perfect for weddings as the mercury drops to make things a little more bearable for outdoor ceremonies, plus the changing colours of the leaves on trees make for a striking backdrop. Here’s what you need to plan to ensure your autumn wedding is as spectacular as possible. An Autumn wedding provides the perfect opportunity to get outside and celebrate your love in the heart of nature. This is because the weather is typically still quite warm, but doesn’t have that same heat of the peak of summer, so guests (and the happy couple!) will be more comfortable in the sun. Later afternoon and early evening events can be particularly stunning, as the setting sun perfectly highlights the gold and amber leaves. Whether you opt for a canopy in case it rains or risk it with a fully uncovered outdoor ceremony and reception, make sure you bring the mosquito repellant and sunblock to keep things comfortable. Outdoor autumn ceremonies call for vintage, shabby-chic and rustic themes. Let the autumnal colour palette guide your colour scheme, and go for warm, cosy decorative touches rather than in-your-face glamour. A long, white table in a meadow for the reception would work beautifully, especially when there are fairy lights dangling above diners and festoon lights hanging low from tree branches. Wedding lighting is a key feature of any special day, and it really comes into its own at outdoor ceremonies. Subtle twinkling fairy lights weaved through surrounding foliage will make your venue seem like an enchanted haven, even if it is just your uncle’s paddock by day! Autumn flowers and shrubbery is perfect for an outdoor wedding, and it doesn’t have to cost a fortune. Pick wild flowers and arrange them in vintage vases and glasses with leaves and other foliage for unique, hand-made centre pieces. Do the same for your bridal bouquet and you’ll have saved big time on your budget. 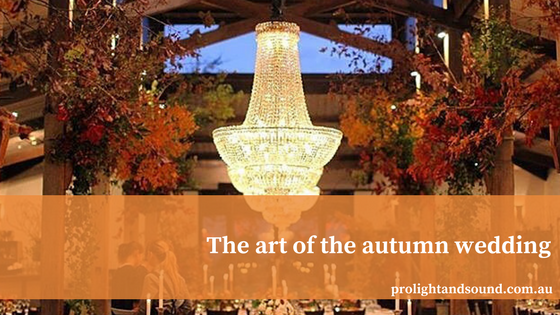 Get in touch to see how we can help your autumn wedding be a truly romantic affair to remember!